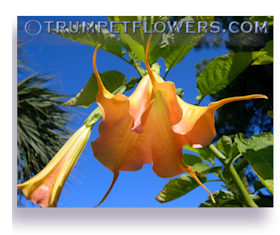 Brugmansia suffer from many of the same maladies that other subtropical and tropical garden plants do. Some of those issues have to deal with the stems and trunk of the tree. But also in Brugmansia, one has to note to be careful about stem blight and how it appears. Unhealthy material is shown in picture to your right. That is very important. Darkened tissue surrounding the nodes is an indication that the stem or trunk where it is located might well have SB, or Stem Blight. (the plant may or may not indicate the darkened splotches.) Notice it also causes scarification, or scarring, of the stem/trunk. 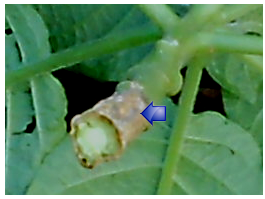 Can also present canker form. It is a type of fusarium fungus that infects the outer and inner tissue of solanaceae plants. Overseas, this is known as StrangleBrand, or stengelbrand. Stem Blight is a combination of fusarium and phoma, that eats it&apos;s way through your angel trumpet, and leaves behind a dark brown or black center. You can only see this when cutting through that part of the plant. It appears mostly in cooler, damp or humid conditions, which allows this type of fungus to thrive. Stem blight in brugmansia seems to prefer the yellow cultivars, but it will go after pinks too. If it&apos;s darkened material, or looks like the one pictured, you really should get rid of the plant, and not share any cuttings of it. Throw it on the burn pile, along with the soil. Sterilize your planting area with weakened bleach solution. It is advisable to throw away the pot too. If it is expensive, put it through a strong bleach sterilizing routine and let the pot completely air dry. Keep an eye on the rest of your collection, making sure to destroy with fire anything that resembles it. 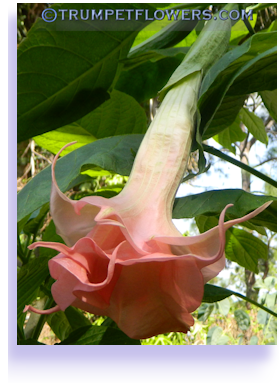 Monika Gottschalk is a world reknowned Brugmansia hybridizer, whom I think first discovered this a few years back. 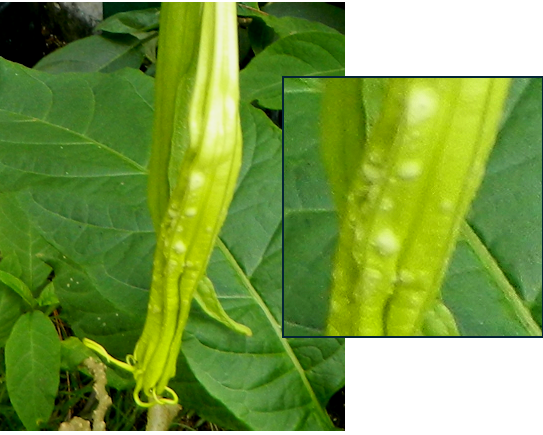 Here is a link to more on this from Germany: Stem Blight in Brugmansia. Read what Monika has to say about this. There are also pictures which may help you to identify it. 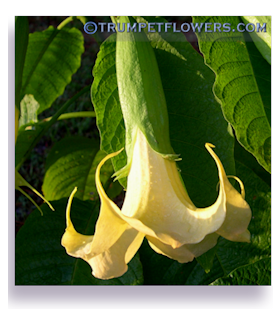 There are prevention methods, so your brugmansia never get this in the first place. These are stronger, commercial type chemicals. A systemic soil drench called Banrot made by Scotts is excellent. When used in conjunction with the foliar spray Cleary's 3336 WP, it has been shown to halt this disease, but of course, it does not cure it. 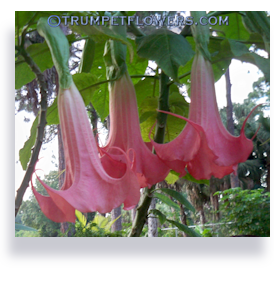 Banrot can also be used to protect seedling brugmansia from dampening off. Use at the rate of 1/2 teaspoon to a quart in a tray that the seeds and pots rest in. Reapply as the water dries up, and seedlings appear. 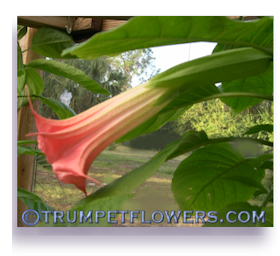 You should never share cuttings of this type of affected brugmansia with anyone. 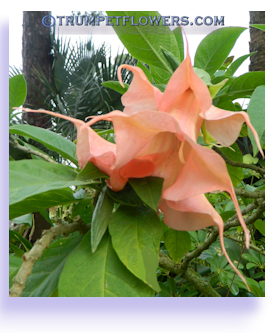 A plant (so far) cannot be &apos;cured&apos;, although there are several people in the brugmansia community working to do this. Most good Nurserymen and gardeners throw the plant and soil, pot, on the burn pile. If you do keep it, do not let it near your collection. Quarantine, treat it with Banrot and Clearys, and remember, don't share cuttings of it! One more thing to note. Spraying a copper fungicide mixture with too high of a copper ratio can cause a similar looking stem or trunk or stem. It burns the outer periderm, but if not done too badly, the plant will live on. This section just won&apos;t look pretty. Be very careful and use the proper amount of copper in you bordeaux mixes. I learned this the hard way, and hope you don&apos;t have to. 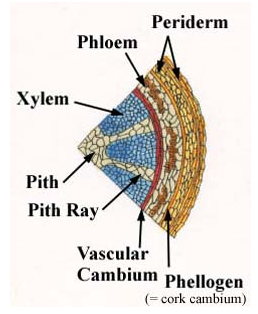 There is no black spot on the phellogen of the stem if it is from over-use of copper. 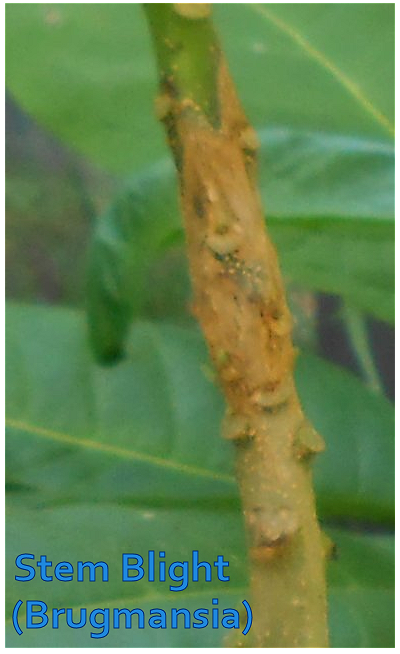 Horizontal Corking of brugmansia bark is said to occur when the plant has been attacked by a pathogen. 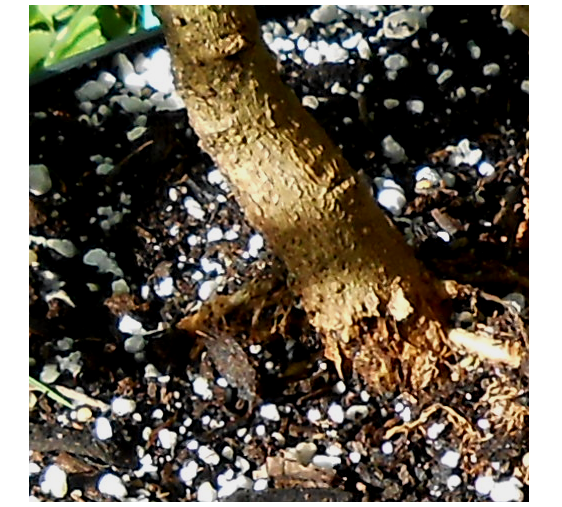 To isolate within itself this pathogen, the plant creates cork to try and heal itself. In almost all cases, the plant&apos;s immune system is so weakened, it will not survive and remains forever infected. There are brugmansia growers right now trying to cure this. Vertical corking does normally occur in certain brugmansia cultivars. Herrenhauser Garten and Desiree are cultivars that do this. There is nothing wrong with it, just a funny looking trunk. However, there have been observations that these types of cultivars do have weaker immune systems. Best to go with other newer cultivars with same colors and types of flowers and avoid corking ones altogether, in my opinion. Make sure your remaining plants receive good air circulation. Protect them from flying, chewing insects, which can transfer this disease. If you don&apos;t want to use super strong chemicals, try a Fungal aid like Mancozeb. This fungicide will not cure your plants that already have Stem Blight. It will only work to better protect your remaining collection. Mancozeb is used to stop and control many fungi problems gardeners have. 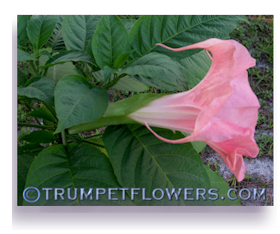 Sometimes, and it&apos;s rare, your Angel Trumpets may throw some warty looking blooms, as seen above. The concensus on this is that it is caused by too much humidity, or overwatering. This condition is known as Oedema. Oedema can also affect other parts of the plant, such as the leaves. Perhaps the forming flower took in too much water as it was forming in the calyx. Nonetheless, it is not fatal, and will leave the plant unharmed as the humidty and water levels fall. 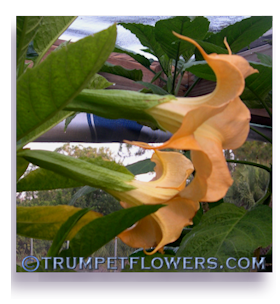 Sometimes brugmansia will get attacked by a fungus at the tree&apos;s base. This can be seen as strippling of the bark, sometimes peeling, or rotting. This is usually seen when the plant has been overwatered, or it is your rainy season. You can potentially save the plant with fungal aides like Banrot. If it is too far gone, simply cut it at the base and then make new cuttings from healthy tissue further up the plant. You will still have to treat the cuttings for Base Rot. This entry was posted on August 23rd, 2013 and is filed under Plant Pathology.